Tests were held from 10-11-2018 to 15-11-2018. APPSC has released the Answer keys of Departmental tests. So, Candidates who were appeared these tests, they may send their objections on Question or Key. 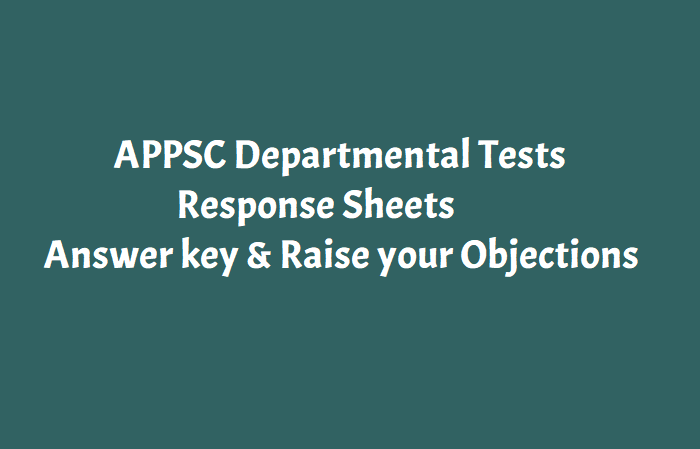 Candidates may download the Response sheets from the psc website. The AP PS Commission has decided to share the keys with the candidates to invite objections on the question / key. Accordingly candidates are allowed to download the respective response sheets marked with key of themselves from 22.11.2018 and to send objections if any in written mode, invariably through the proforma available in the Commission’s website on or before 03.12.2018 through post only. APPSC would not accept the application for objections through online or by any other mode like messages, email, mobile, whatsapp etc., and only written objections as in the model format of Commission’s website received under proper acknowledgement would be considered. The results will be finalised on taking into consideration of the genuine objections. The objections which are vague and without proper details will not be considered. Decision of the Commission on all objections received, shall be final and no further correspondence in the matter will be entertained. The objections should reach the Commission’s office strictly on or before 03.12.2018. APPSC is not responsible for any postal delays. My name is Ramesh.When will release Tsdeecet web options schedule.It is very delay our govt.Its too late.